This is indeed the meme that journalists have been using since the murder of the Henkins last year. But if you look at Palestinian Arabic sources, you know that this isn’t true. According to their own words, these attacks started for one reason only: because of supposed Israeli designs on the Al Aqsa Mosque. After the first month or so, a new reason was given: revenge attacks because Israelis defended themselves by killing would-be murderers. At no time in Arabic did Palestinians claim that this was some sort of spontaneous uprising because somehow they just hit the tipping point. Of course, the real reason is exactly as Israel says: it is the result of incitement. Mahmoud Abbas lit the match when he gave his “filthy feet” speech calling on Arabs to defend Al Aqsa from a few people with yarmulkas walking around their holiest spot. Immediately after the incident, the suspects’ parents were taken to the police station for questioning. Members of the Abu Amar family were having a hard time processing the events. The girl’s uncle, Ahmed Abu Amar, concurred. “I must say that if this happened in this family, it’s totally unacceptable; we have good neighborly relations with the Jews and we are shocked at what happened today. I can’t imagine any reason for her to do such a thing,” he said. 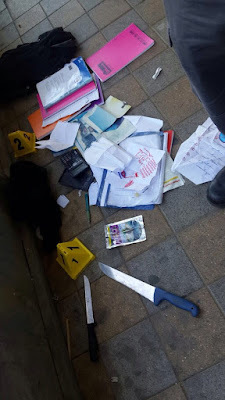 13-year old girls decide to stab Jews instead of going to school because of brainwashing, and it works because there is no visible Arabic-language media that countervails the non-stop messages of hate. So where does AP get the idea that the reason for these attacks are the “occupation”? It is mostly laziness – years of reporting that the “occupation” is the worst human rights abuse situation in the world necessitates it becoming the obvious reason for stabbing Jews. But since Ban Ki Moon has legitimized that excuse, the media is running with it. Accuracy isn’t as important as the narrative.